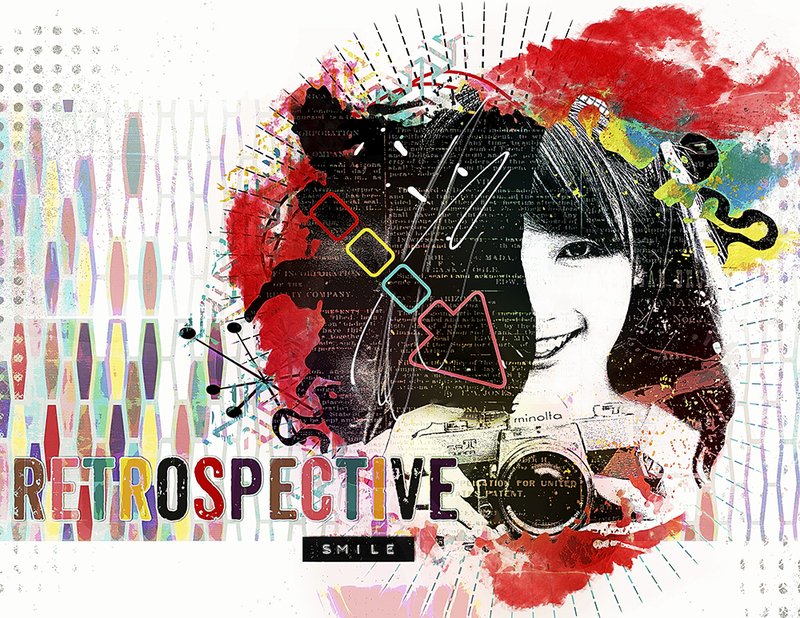 Retrospective is a kit that i love for the fantastic Retro vibe that it has! Some awesome papers and elements are in the kit, that can help you make a wonderful Retro page, but also other happy colorful pages can be made with it. I made a kind of Retro photo art page with it. I love the contrast between the black and the vibrant colors! I used the Treshold filter on my photo. I clipped the photo to a photomask 2 round mask. I extracted the pattern from the background out of the photo and placed it under the photolayer. I extracted the type from a paper and clipped it to the photolayer. I added all the artsy bits and pieces, elements and added some Magic Lights and set them to Color Burn Blend mode. I placed the the WA. After the merging I did some Dodge and Burn work and some Sharpening.